Are your muscles feeling stiff and aching? Do you want to consult a physiotherapist to ease your body pain? If yes, Etobicoke SportMed & Physiotherapy is here to serve you. We have a team of registered physiotherapists who are qualified in diagnosing and treating the muscle stretch and sprain conditions you are suffering from. 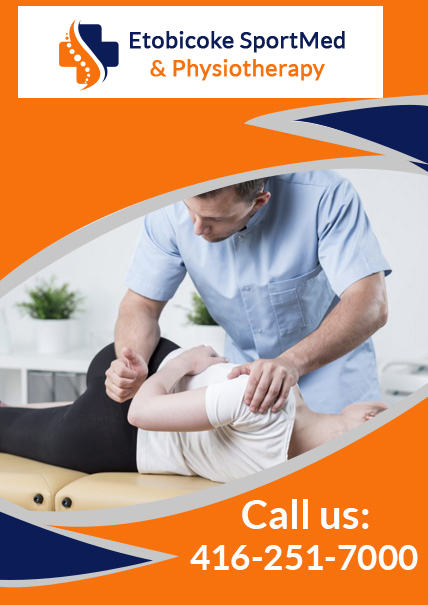 Whether your chronic body pain is due to bad posture, arthritis or a sports injury, we provide a customized physiotherapy treatment to ease your symptoms. We follow an evidence-based approach to analyze your condition and the reason behind it. Once the diagnosis is complete, we’ll conduct a physiotherapy session with an aim to improve your body movement, body balance, muscle strength, posture and mobility. Etobicoke SportMed & Physiotherapy is a health clinic located in Etobicoke offering a myriad of wellness treatments including acupuncture, massage, chiropractic care, orthotics & many more. Contact us to schedule an appointment. © Copyright 2019 Etobicoke SportMed & Physiotherapy. All Rights Reserved.